This afternoon Mr. Tung Kai Ying who is the chairman of the International Tai Chi Association and his two hundred and thirteen foreign students who came from the United States, Canada, France, Italy, Sweden, Denmark, Finland, and Ireland came to Xingtai. 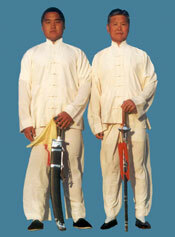 They came here in order to hold �99 Master Tung�s International Tai Chi Celebration. Mr. Zang Shengye, who is the secretary of Xingtai city met Mr. Tung warmly and praised him that he had so many students all over the world. This evening the city held a big welcoming banquet and the leaders of the city including Zang Shengye, Ma Lancui, Jia Chansuo, Shi Yuchun, Ren Baolun, Wang Aimin attended it. Mr. Zang Shengye who is the secretary hosted it. Mrs. Ma Lancui who is the mayor of Xingtai made a speech. First, Mrs. Ma stands for leaders of Xingtai city and six million four hundred thousand people congratulated this big celebration. And she said, she was happy and welcomed Mr. Tung and his students. Mrs. Ma said, Chinese wushu has a long history and has many many things to study. Tung's Tai Chi is a beautiful flower in Chinese wushu garden. Mr. Tung learned it very well and taught it all over the world. He let the world know it and promotes the communication between Chinese people and the people of different countries. She hoped that everyone who visits here could seize this chance so they could know more about China and about Xingtai. At the same time she made good use of this chance and talked about international cooperation in economy, trade, science and other fields. We look at this cultural communication as a bridge between China and the world. Mrs. Ma also discussed the economic development and the culture of Xingtai city. After that, she said, Xingtai is an open city for every country and the people were welcoming. The people of Xingtai welcome you and treat you well whatever you come here for, travelling, investing or visiting. She hoped foreign friends could introduce something about their countries. So we could know each other better. Mr Tung also made a speech and said Xingtai was his hometown. This was a place giving birth to great men and the hill of Xingtai is beautiful. Its people are clever and hard working. Though I am abroad, my heart belongs to my hometown. I am happy because I have this opportunity to communicate with my hometown's people. I will do my best to let the world know the changes taking place here and would try to do something for Xingtai�s development. During the banquet, Mrs. Ma give Mr. Tung a plaque with Expand China Wushu, and Happy the World. Mr. Tung gave the government a plaque, with For Country For People, and presented foreign office of Xingtai a plaque Sweet Overseas Chinese and Friendship Long Life. And we know foreigners will perform Tai Chi and visit Factories in Xingtai.